Dog urine can ruin unfinished wood. The key to eradicating urine stains and smells on hardwood is getting to them as soon as possible. Urine can seep into your wood floor if you don't clean it up thoroughly and immediately, and stains and odors will be hard to remove once they set. Unfinished wood is especially vulnerable. Blot up the urine with a clean rag, removing all the liquid. The sooner you remove the urine, the easier it will be to get the stain and smell from the wood floor. Scrub the floor thoroughly with a solution of water and vinegar. Sprinkle baking soda directly on the stain and let sit for a couple hours or as long as possible. The baking soda will help soak up and deodorize the smell. Wipe away the baking soda with water and another clean cloth. The stain and smell may be gone if it didn't seep too deeply into the floor. Apply an enzymatic cleaner directly to the spot. Soak the area entirely with cleaner and let sit for a period of time, following the instructions on the cleaner bottle. Pet urine enzymatic cleaners like Nature's Miracle are available at pet stores or online. These cleaners do not just cover the stain and smell; they dissolve the urine completely by breaking it down with natural enzymes. You may need to repeat this process. 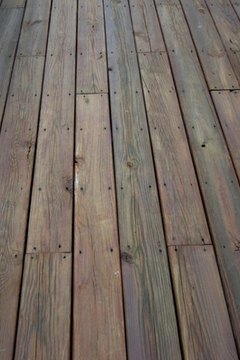 Sand the wood down if the the vinegar and baking soda and enzymatic cleaner methods fail to yield results. Use a sander to gently remove the stain. On unfinished wood, sanding will be fairly easy to do. Priming and finishing the wood will help protect from urine stains setting deeply in the future. Do not use harsh chemical cleaners on your unfinished hardwood floor. Chemical cleaners are not designed to remove pet urine and may cause even more damage to the floor. If you do not succeed in removing every trace of urine, your pet may urinate in the same place later. 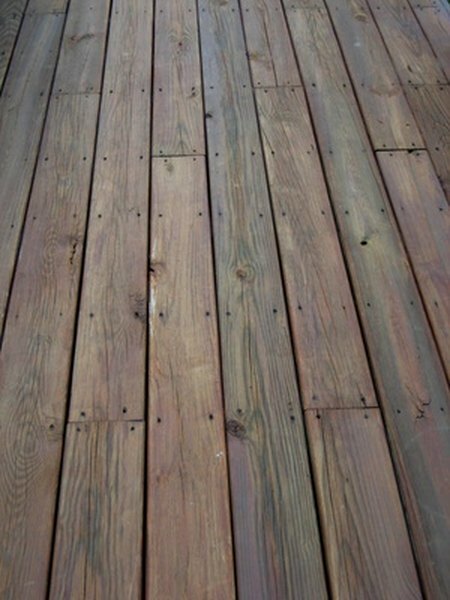 If you let dog urine sit on untreated wood for too long, it may leave a dark mark that is very hard to remove. While treating the floor, keep your dog and other pets away from the area so they don't ingest the cleaning solution. Kayla Richard has been writing from Rochester, N.Y., since 2007. She holds a Bachelor of Arts in English writing arts from SUNY Oswego and a graduate certificate in nonprofit management from SUNY Brockport. Does Bitter Apple Keep Dogs From Peeing? How do I Remove Dried Dog Urine Stains From the Carpet?